General Assembly - As introduced, enacts the "Tennessee Balance of Powers Act." On Tuesday, April 2, 2013, history was made. Legislators and their constituents have long expressed concerns about the interactions and affects of federal actions on the manner in which our state government operates, or which could have a potential impact on the rights and privileges of the citizens of Tennessee. We had been wrestling for some time with the best way to address this very important issue of providing an established venue to examine these actions. As amended, SB1158-HB970 seemed provide that venue except that it had a fiscal note that would probably have interfered with its passage. 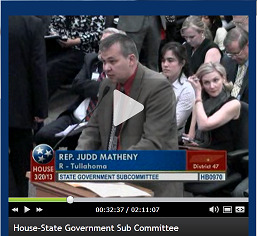 Our hero, Rep. Judd Matheny, Chairman of the House Government Operations Committee and sponsor of HB970, came up with a brilliant idea. 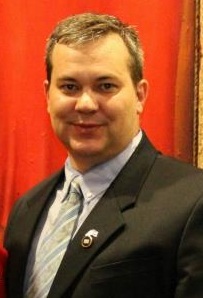 He and Sen. Mike Bell, Chairman of the Senate Government Operations Committee would seek the support from the respective speakers to establish a subcommittee of the Joint Government Operations Committee that would be authorized to review both introduced and enacted federal legislation, rules and regulations and executive orders, then report any relevant findings to the speakers, members of the General Assembly and Congressional delegation. Then decisions could be made about what actions might be appropriate moving forward. When Rep. Matheny and Sen. Mae Beavers attended the respective committees to present SB1158-HB970, they were able to report that Lt. Gov. Ron Ramsey and Speaker Beth Harwell had agreed to this plan and the subcommittee will be established so both bills were taken off notice. As far as we know, Tennessee is the first state to provide this kind of venue for the review of federal actions. We can only hope that other states will follow our lead! You can read the letterHERE. Pleased to report that the committee members have now been appointed. Their organizational meeting was held on May 1, the first official meeting will be on August 21.